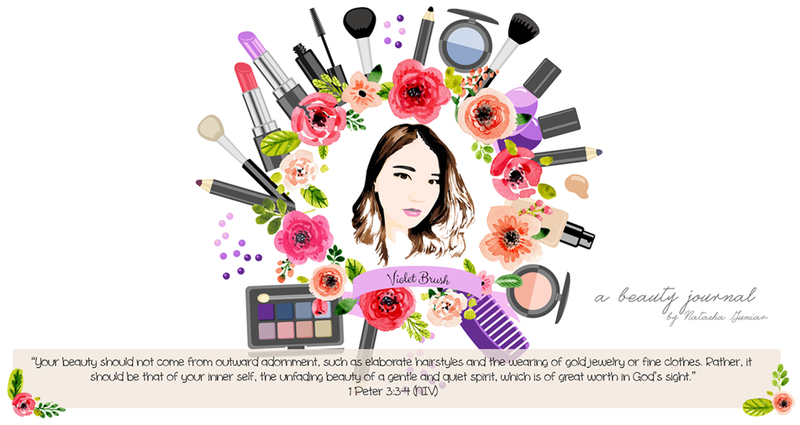 For me, a good makeup comes from a good skin and a good skin comes from suitable skin care + thorough cleansing. 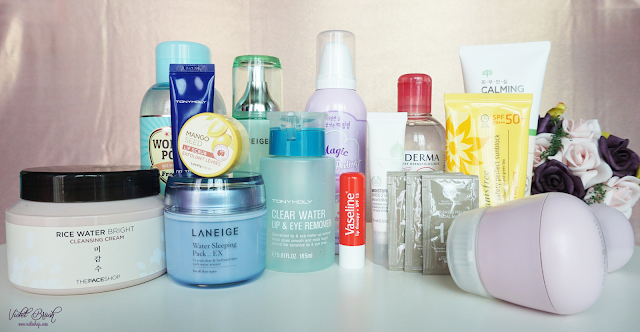 Therefore, I paid a lot of attention on my cleansing products. If others do double cleansing, I do triple cleansing, or should I say quadruple? I usually start by removing my eye makeup and lipstick with the cleansing water since I don't really like the greasy feeling from cleansing oils (I learnt how to remove my eye makeup through Pony's video here). Next, I apply cleansing cream all over my face and wipe it off with tissue. Why not cotton pad, you might ask. Cotton pad is actually good for removing eye makeup but not for your entire face since cotton pad has soft and tiny fibers that could clog your pores, unless you wet it first. But I find that it's quite bothersome to actually wet the cotton pad first and it doesn't work efficiently so I choose to use tissue instead. 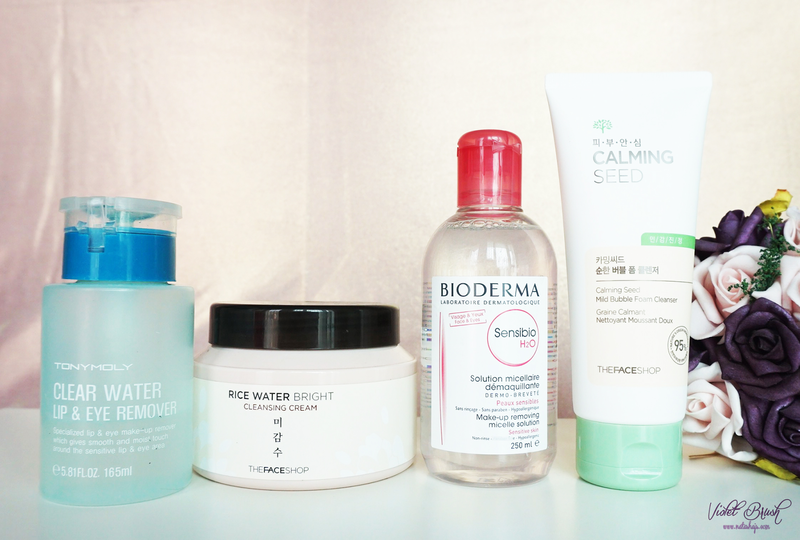 Claimed as the best cleansing water, I got my hands on Bioderma. At first, I tried Bioderma's Sebium but since it's formulated for oily skin, it didn't suit well on my skin. I use this Bioderma after using the cleansing cream and I couldn't help but get awed that I found that there were still some of my foundation remaining. As for my cleansing foam, I went back and forth over the past year. I used this and that but those still made my skin felt tight after use, or even dry. Finally after the long search, I came across this Calming Seed Mild Bubble Foam Cleanser from The Face Shop that suits really well with my dehydrated skin. It looks like almost every beauty bloggers around the world raved about this magical device. Yes, I said magical. 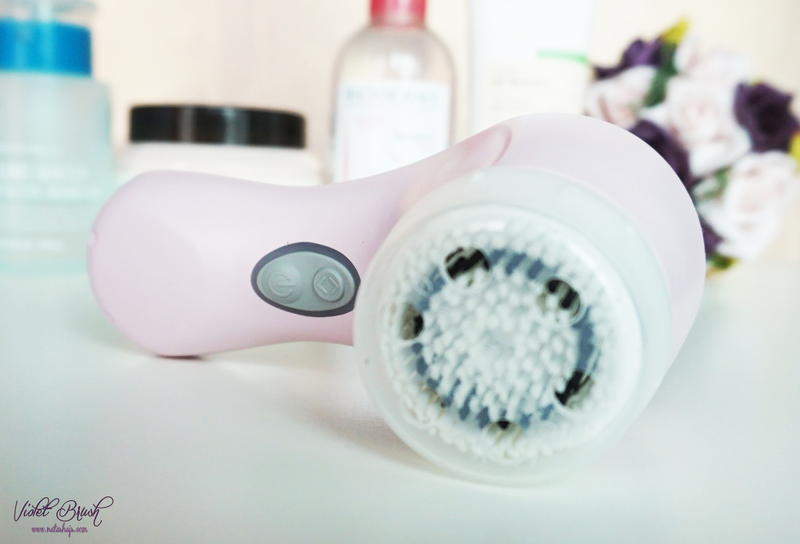 Since I used Clarisonic, I feel that my skin is cleansed thoroughly. Bioderma does its job well in removing the remaining foundation but Clarisonic does the job even better. I don't use this everyday since I can't afford to change the brush head every 3 months, I only use this device when I did my makeup. 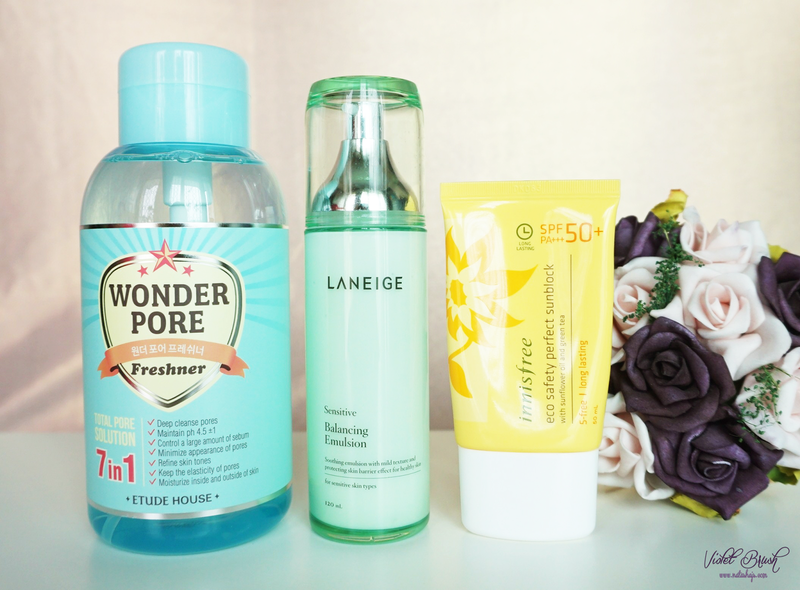 Even though I have sensitive skin and my skin tends to be flaky around the nose when I use skin care products for oily skin, my skin doesn't complain with this Wonder Pore Freshner from Etude House. Surely, it helps me in controlling the excess oil. So far, I haven't found any other moisturizer that fit my skin as well as Laneige's Sensitive Balancing Emulsion. It's water-based and doesn't feel heavy on the skin. The down point of this Sensitive series from Laneige is that the products from this series haven't entered Indonesian market officially so I had to pre-order from online shops. I plan to change to Laneige's Light Balancing Emulsion hoping that it would fit my skin as well as the Sensitive one. SPF 50 might be too much for some. But for a student like me who lives in a tropical country and goes out every single day for class, I often forget to reapply anything to my face. Thus, my solution is to get sunblock with higher SPF. I do have a plan to change this to the one with SPF 35 since I think it would be enough for daily but I'm gonna emptied out this first. I don't actually use any special night creams at the moment since I haven't found one. I usually use eye cream because I sleep late most of the time and this eye cream from The Body Shop has refreshing and cooling effect upon its use. 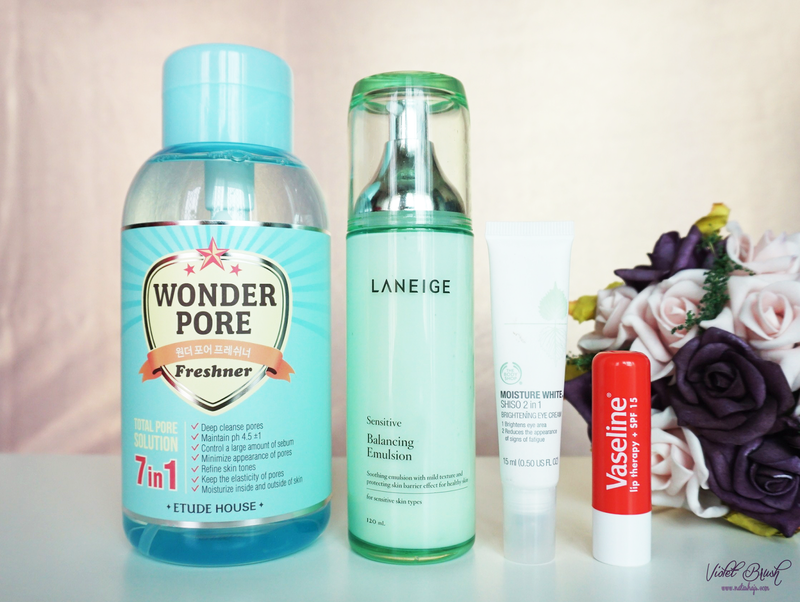 I have written in another blog post before that I hated the greasy feeling from a lip balm but surprisingly, Vaseline's lip balm feels less greasy. I usually use this before I sleep to keep the moisture on my lips as I sleep in a full air-conditioned room. Sometimes I do apply lip balm on the mornings too but most of the time, call me forgetful but it slips off my mind. Laneige's Water Sleeping Pack EX always comes to rescue when my skin becomes very dry. Normally, I would use this once a week but very often, I forgot or just too lazy to apply it. Check out my full review on this baby here. Either you have dry skin or not, I strongly recommend you to try this as this product is just that good. Pimples and acne could be said as two of the skin's most annoying enemy. I previously used the lotion type but it's quite complicated to use especially at night before sleep, I had to dip a q-tip and apply it to the red spots. When I went to Tony Moly to repurchase the lotion was unavailable so I bought this tube cream type instead and I love it very much. Much more convenient to use and it dries my pimples and acne pretty quickly. You might have known that I love the soft and smooth aftereffect from peeling. 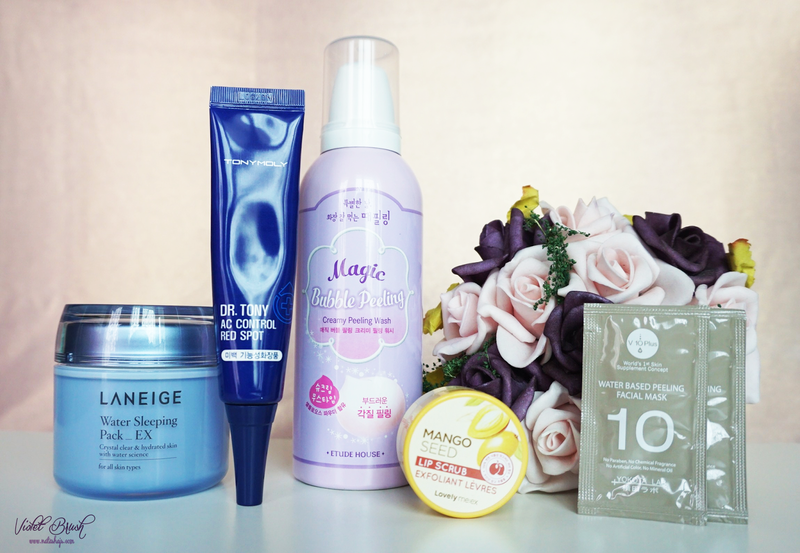 V10 Plus has always been my fave and recently, I have been trying out Etude House's Magic Bubble Peeling, though I still love the Tony Moly's one though (review of V10 Plus here, Tony Moly here). I usually do peeling once in two weeks but that's if I do remember, I'm a forgetful one, I know. I always hate how my lips cracked when I use lip products. Therefore, lip scrub is kinda essential for me. I usually scrub my lips when I remember, usually after I remove my lip makeup. However, speaking of facial masks, I don't have a certain fave. I use facial mask once a week and just pick whatever catch my eye. Some of you might be unfamiliar with this brand, Nu Skin. This is not a widely-known brand but I'm glad I came across it. My aunt give me this as a present and seriously, I'm in love. It refreshes my skin instantly and return the moisture of my skin, especially when I went out and wear makeup all day long. Nath, that's lots of stuffs!!! You're so nice for sharing these info! Very few people would be so selfless.